The ban on the Samsung Galaxy Note 7 has been extended to Mihin Airways, SriLankan announced today. SriLankan Airlines has completely banned the use or charging of Samsung's latest Galaxy Note7 smartphone on board all its flights with immediate effect until further notice, following Samsung suspending its sales in the wake of several incidents of phone batteries catching fire. The ban applies to turning on or charging any Samsung Galaxy Note7 on board,or shipping it in checked-in luggage and cargo. Passengers are also being advised of the ban through on-board announcements and notices at airport check-in counters. Several other airlines and aviation authorities have also announced similar bans. 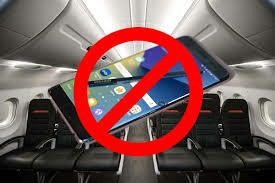 The international Air Transport Association (IATA) of which SriLankan Airlines is a member and United States Federal Aviation Administration (FAA) have also issued directives banning the use and charging of Samsung Galaxy Note 7 smartphones on flights.